At the risk of sounding like a broken record, the recent Whisky-Online Auctions sale demonstrated extreme polarisation in Macallan values. On the rise, we saw a bottle of the Cask 888 decanter hit a record £4,500 and the Robert Burns decanter achieve £2,350. Highly desirable limited editions still look impressive from a performance perspective. Both the ‘M’ Decanter and the recent Reflexions decanter fell to their lowest recorded prices of £2,500 and £725 respectively. 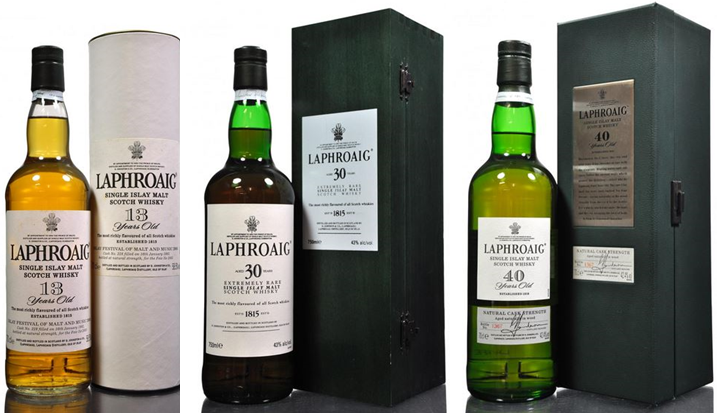 Showing age absolutely matters from a collectors perspective, both the 30 and 40 year old Laphroaig’s sold for record prices. The 30 year old sold for £1,150 and the 40 year old (non-vintage variant) hit £3,100. As recently as 2012 the 40 year old was still selling for £1,500 and the 30 year old was snapped up for just £320; impressive gains for both these old aged bottles. Top performing trio of Laphroaig. Showing rarity also yields interesting results as well as age, a bottle of 13 year old Laphroaig, Feis Ile 2005, sold for £525 having a previous all-time high of £410 in 2013. Auchentoshan are rarely mentioned in these pages so it was pleasing to see a bottle from cask number 793, a 1973 vintage 29 year old, peak at £380. In 2008 these bottles were selling for as little as £85. Morrison Bowmore stablemate, Glen Garioch, had an exceptional result when a bottle of 1968 vintage 34 year old from cask number 17 sold for £1,000. At its previous auction outing in 2013 it achieved £500. 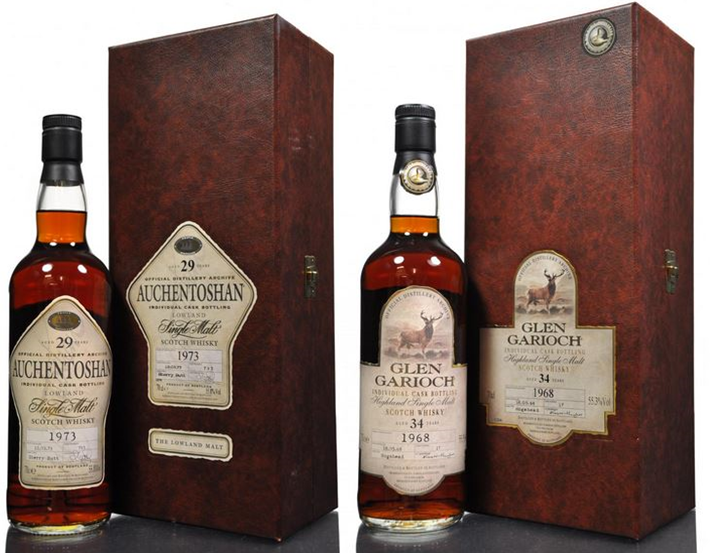 Auchen-Garioch brothers. Morrison Bowmore distilleries continue to show upside. Another infrequently mentioned distillery, Dalwhinnie, saw a bottle of Cadenheads (dumpy green bottle) 1966 vintage 18 year old achieve £320. In 2009 prices were pegged down at £160 for this rarity. Signatory bottled Brora 22 year old. Brora had another good auction with two independently bottled variants achieving new records. 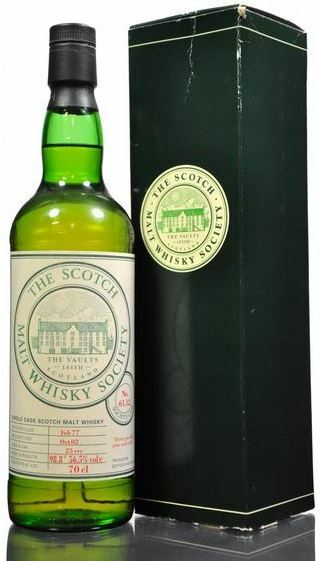 A bottle of SMWS (61.12) 1977 25 year old sold for £440, way exceeding its £280 high in 2013. With a previous best of £165, again in 2013, a bottle of Signatory 1981 vintage 22 year old advanced to sell at £310. Managers Drams have had a somewhat lumpy ride over recent years. 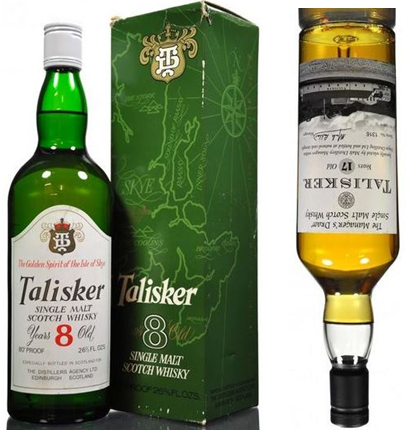 Current movement suggests they may be due a more holistic ‘collection-wide’ increase in value; however, Talisker’s Managers Dram seems to have stepped back significantly. Two bottles sold for £270 and £260. £260 is the joint lowest price paid at auction in the UK with the highest being £550 in late 2013. Conversely, a bottle of Talisker 8 year old bottled in the 1970’s sold for £525 setting a new record for this variant. The 1970’s bottle has yielded a 64% increase over its 2012 price of £320 whereas the Managers Dram has lost 53% of its value in less than two years. 1970’s Talisker 8 year old up 64%. Talisker Managers Dram down 53%. With just nine bottles of Highland Park at this auction it was encouraging to see two of them achieve new high-points. The 1973 Dragon sold for £650, some 51% ahead of its previous price of £430 in 2014. A bottle of 1986 vintage from cask number 2794 hit £320 which was 19% better than its 2014 price of £270… In June 2012 just £110 would have bought a bottle. In terms of general values, February looks to have got off to something of an exceptional start with many bottles in the Rare Whisky Icon 100 Index (RWIcon100) moving north. Running the numbers for the RWIcon100 index at the February mid-month point shows a 6.08% increase over January. February has a way to go yet before the final numbers are published so anything could happen. It’s still the older rarer bottles from iconic distilleries or silent stills which are showing the growth. Other areas of the market are almost withering on the vine giving great opportunities to snap up quality drinkers at minimal cost. If the aforementioned increases can be sustained throughout 2015 we could be looking at a particularly good year for whisky as an investment. Previous PostWeekly Auction Watch – 10th Feb 2015Next PostAnnandale – The Million Pound Cask – The Ultimate Investment?